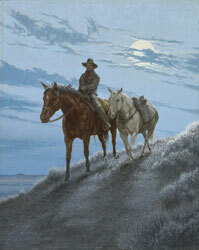 This painting was inspired by the cowboys who made their living by working for a season with one ranch outfit and then moving on to the next. They were usually good cowboys but ranch owners and foreman's called them saddle tramps. They usually owned a few horses of their own as well as their bedroll and whatever they could carry on a pack horse. This is a limited edition of only 200 paper prints or 50 Giclee canvas prints signed and numbered by the artist. The image size is 16" X 20". The price is $200.00 for the unframed paper print. To order please call 1-307-868-2111, e-mail us, or use the online add to cart button below. $450.00 for the unframed canvas print. Please ask about our custome framing. Please order online, E-mail or call us 307-868-2111.